Since 2008 the Windsor Workers’ Education Centre (WWEC) continues to be a community organization of workers, students and activists committed to improving the lives and working conditions of people in low-wage, precarious employment. Our goal is to ensure that non-union workers have a voice at work and are treated with dignity and fairness. Located downtown at 328 Pelissier St., WWEC provides a new way for people to join together to fight for fair employment. People who are directly affected by poor working conditions should be the ones providing leadership in the struggle for fairness and dignity at work. We meet with workers for education and advocacy, volunteers, WWEC is hosting a Forms Clinic through a partnership with the St Clair College Para-Legal program for a second year (details at left side panel). In 2013, WWEC received an Ontario Trillium Foundation grant for $216, 000 over three years to hire a Volunteer Outreach Coordinator (VOC) who conducted numerous workshops for students and workers engaged in non-union, low wage work on their rights under Ontario’s Employment Standards Act. The VOC also recruited dozens of student volunteers from the University of Windsor and St Clair College. 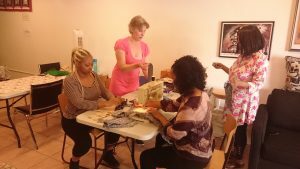 During this time WWEC engaged with dozens of workers through various settlement agencies (YMCA, Women Enterprise & Skills Training, Windsor Women Working with Immigrant Women, Multicultural Council of Windsor); those workers being primarily women of colour and recent or established newcomers. 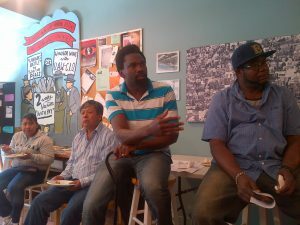 TFWs from Jamaica explaining their plight. The workplaces involved were generally non-union manufacturing plants and greenhouse/packaging operations. These workplaces are staffed with workers on Ontario Works, unschooled labourers, newcomers including refugees and temporary foreign workers. Many of these employers use temp agencies and the turnover rate is high. The workers then have different statuses and rights under employment law. They are fearful about ever speaking out. We sought another Trillium grant this summer, and also a grant from The Atkinson Foundation’s Decent Work Fund but were unsuccessful. We are working on another Trillium grant application with a deadline of Feb. 22, 2017. Even as powerful advocacy work is continuing for more effective labour laws, a higher minimum wage, lowering student fees, and so on it is necessary to consider that the austerity agenda isn’t going away anytime soon. For that reason and for reasons outlined above on the tough conditions facing non-union workers, it is necessary to broaden the mandate of WWEC. Much work and research is being conducted around the world on democratically run worker owned enterprises, the concept of the “solidarity economy”, and ways of transforming the existing economy from a profit driven exploitative model to one that puts the needs of citizens – of workers – at the centre. WWEC just recently joined the New Economy Coalition, and I have attended conferences over the last two years in Detroit which explored what is meant by a solidarity economy and “New Work”. WWEC can become the centre in Windsor for education on worker coops as well as an incubator for real workplaces run democratically. In line with this, Mireille Coral, an adult educator and local teacher, has been running a sewing collective at WWEC where skills development has been the focus in order to go further and help form a worker cooperative. She has attracted interest from settlement agencies and we can see that with further skills development and education on worker coops, it is possible to have an enterprise up and running in months. Work is what humans do, and the heart of a solidarity economy is that workers should own the work they do in order to be better able to not only live decently, but also take part in the social, cultural and political life of the community. At present, too many workers are either un/underemployed and isolated or must carry multiple part time low wage jobs leading exhaustion. This letter is meant to inform you of our work so far, what we will continue, and where we want to go in order to be a part of a new movement where workers become agents of change rather than submitting to an exploitative work regime that denies dignity to workers and also denies them a living wage. As we work toward another funding model, ultimately an enterprise that could support workers and WWEC, we are asking for your help with a donation in any amount (tax receipts available as WWEC is a registered charity). And more, we are asking you to become a member of the organization and pass this appeal along to your networks.